The dragon depicted here is rather a hybrid. It has the formalization of the typical kui, with legs transformed into foliate design elements and the body covered with archaistic motifs, but the head of the softer, more lizard-like chi dragons. It is typical of Qianlong archaism, where the subject of formalized confronting kui dragons was particularly popular at court on a series of snuff bottles in hardstones and glass, many of which can be dated to late in the reign. (See Treasury 1, no. 29, for the citation of other examples.) Given the popularity of archaic chi and kui dragon motifs at court and their relative rarity as primary decoration at other centres during the Qianlong period (see discussion under Treasury 1, no. 99, abbreviated under lot 196 in this sale), we have a reasonable basis for believing that this bottle may have been one of the many thousands undoubtedly made for the court that did not bear reign marks. 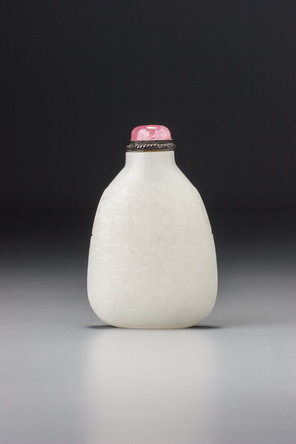 In fact, it is only rarely that reign-marked jade bottles with genuine, original marks (as opposed to recently added ones) are found, and among these anything other than a Qianlong mark is still rarer, although there are a few other jade objects (inkstones, cups with cup stands, bowls, etc.) with Jiaqing and Daoguang marks and, still more rarely, later ones. Where it was made, however, is another matter. The popularity of this subject during the late Qianlong period suggests the possibility that this might date from the post-1760 period, in which case there were as many as eight imperial facilities producing jade for the court and it could have been made in any of them, including the palace workshops. Nor need it be late Qianlong. The impetus of the Qianlong emperor’s personal interest in jade and close surveillance of jade carving style, particularly during the latter part of his reign, suggests that Qianlong quality and style would have been maintained well into the Jiaqing period, and perhaps even into the Daoguang. Anything that is unmarked and stylistically possible for the late Qianlong period could also have been made a little later.